Snuggle baby up in cosy softness with our wraparound body. It's made from 100% organically grown cotton, and it's just the thing for layering under leggings on chillier days. Poppers at the gusset and side make changing a breeze (thank goodness), while a hidden popper keeps everything secure. With its pretty collar and seasonal print, this romper is designed for wintry evenings gathered around the Christmas tree. It's made from brushed cotton for comfort and cleverly placed buttons down the front and poppers on the legs make it a doddle to put on and take off. This sweet little romper is crafted from soft 100% organically grown cotton to feel lovely and smooth against baby's skin. The appliqué teddy has plenty of aww factor, and we've thrown on some poppers along the shoulders and inside legs to make emergency changes easier. 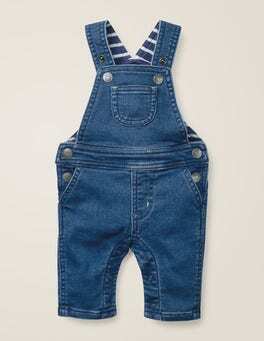 As well as being full of character, these jersey dungarees are sueded to make them really soft and super comfy. The concealed poppers make for easy changing and adjustable straps allow for when baby gets bigger. The smocking details add a great dose of charm. It's all about the details with this knitted play set: bunny noses and tails, handy buttons on the neck for easy dressing and soft-as-can-be cotton for maximum comfort. The jumper is teamed with drawcord bottoms with ribbed cuffs to help them stay put on wriggly legs. Nostalgic? Us? Always. 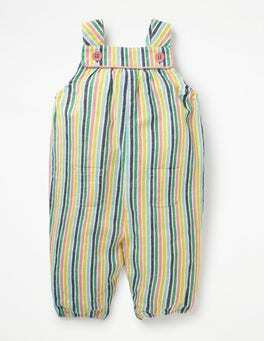 Little legs can wriggle freely in this vintage smocked romper suit. Made from supersoft cotton, it has a Peter Pan collar, embroidered details and elasticated ruffles at the hems for a comfortable fit. Buttons on the back and poppers at the gusset are handy for quick changes. Tiny wrigglers will feel free to move about in these cosy leggings. These cotton-rich designs have ribbed ankle cuffs to keep them in place during crawling expeditions. We've added a hint of elastane so they can stretch to create the perfect fit. 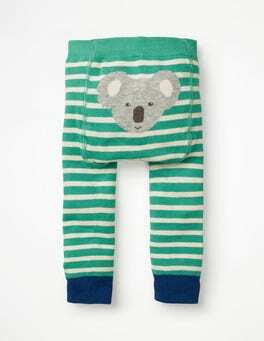 Get your little one feeling warm and cosy in our supersoft cotton-rich leggings. These seasonal essentials are finished with an elasticated waist and ribbed ankles to keep them in place, no matter how much wriggling and crawling baby gets up to. Up the fun factor with our relaxed leggings. They're made from supersoft cotton with a touch of stretch for optimum wriggle room. The ribbed cuffs and waistline ensure they stay put (even when little ones are practising rolling over), while appliqués will make baby the star of the show. …more fun than a playdate? A playdate in a chunky cord playsuit with appliqué pockets, that's what. Poppers at the gusset mean it's easy to slip on, while the full printed lining guarantee all-day cosiness. Strap buttons on the shoulders are designed to grow with baby (and baby’s social circle). Clothes that grow with baby? No, it's not science fiction; these dungarees have adjustable straps so they'll stay the distance. There's two designs to choose from and they all feature a striped jersey lining to keep them supersoft against young skin. 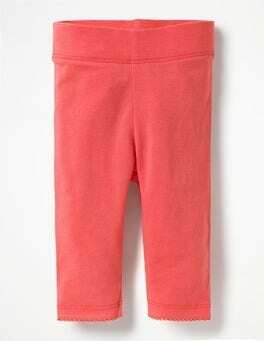 Dressing your little one just got even simpler with these easy-to-wear leggings. As well as being really soft, they're ideal for mixing and matching with any of our dresses to create some adorable outfits for baby. Newborns deserve the very best – that’s why we designed this short-legged romper made with premium 100% organically grown cotton, made without any nasty chemicals. The whale print and easy popper openings will make you love it just as much as your little one. 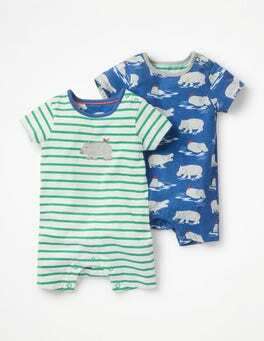 Hippos are having a lovely time on these twin pack rompers. 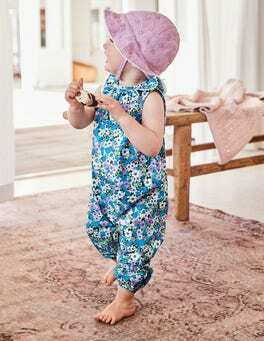 From rolling and crawling to intrepid exploring, these short-cut cotton playsuits are ideal easy-on outfits for busy days. With handy neck and gusset poppers, there won't be any mighty complaints at changing time. 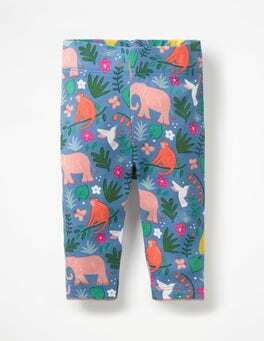 Our bouncing bunny printed leggings are crafted from 100% organically grown cotton and made without nasty chemicals so they're kind on baby's skin. 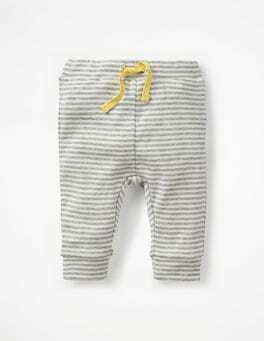 A coloured drawstring waist gives these bottoms extra room for growing little ones. They're perfect for teaming with our matching wrap bodies. Sprout, the office dog, has joined the London Guards in her bouclé hat on this knitted play set. Pair with the ultra-soft and cosy cotton leggings in bold stripes. Our cotton-rich appliqué sets are decorated with adorable animal designs. The leggings are as bright and fun as your little one. Pair with big imaginations for days spent exploring the great outdoors – and it’s all machine washable. It's time for baby's first safari (to the garden). 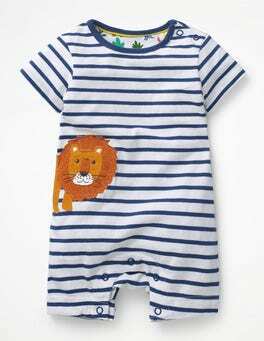 Our soft jersey rompers come in a cheerful print featuring a whole load of animals and a friendly appliqué lion. Changing is a breeze thanks to poppers at the shoulder and around the gusset. Now, let's make some new friends. 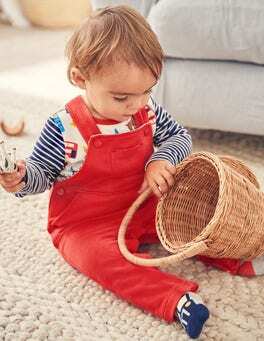 When fun dungarees meet the comfort of soft jersey, a playtime favourite is born. Adjustable straps give baby room to grow and plenty of poppers help at changing times. Striped lining adds a pop of colour, while cheerful yellow stitching brightens up the blue denim. …sisters, cousins and friends in these multi-stripe dungarees, made with the same print as our dress and culottes for older girls. The cotton design is partly lined for comfort with concealed poppers at the legs for easy changes. Straps with colourful buttons are adjustable so they grow with baby. Do you have a little one who just won't stop moving? 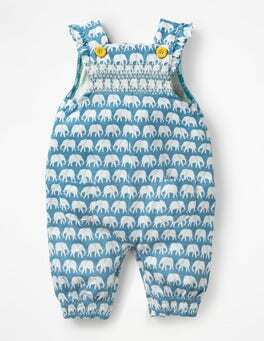 Keep them entertained counting the clouds on this romper. With poppers around the stripy legs, it makes getting ready quick and easy. Delicate newborn skin will love this feather-soft body in 100% organically grown cotton, made without any nasty chemicals. The cosy wrap-around design is kept in place with a nickel-free popper, while the pretty floral print is great for layering with our matching leggings. 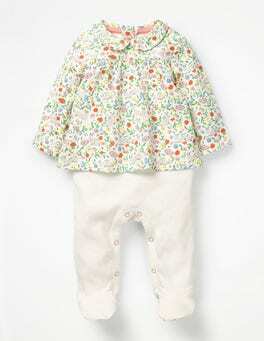 Clothes don't get much sweeter than these bloomers with heart-shaped pockets. The inside is fully lined with soft jersey, which is lovely and gentle on little legs. And they're perfect for matching back to the rest of the range – just add woolly tights to up the cosy factor.